Would you like to give a great gift for Father's Day? Would you like to encourage the man in your life to get onboard for a fun family Walt Disney World Vacation? Maybe you are a man who just wants to learn some great tips for enjoying "man time" while on vacation? Well, if any of these apply to you (or if you just want to read a fun, humorous WDW travel guide book) GET EARS OF STEEL HERE! Ears of Steel is a light-hearted, fun travel guide for WDW that is geared towards the more common interests of the male gender. Here's a bit of a glimpse inside as well as a few words from the author himself, Mr. Bart Scott! "The hairy-backed knucklehead kicked back in his easy chair with potato chip flakes on his shirt and a remote fused to his palm." He thinks that a Disney trip is too expensive, has nothing for him to do, and is just a bunch of kiddie stuff. "I know how to talk to your husband." However, if there's something that might NOT be your cup of vodka, but is something your family will enjoy (and a real man could grit his teeth and tolerate), I'm gonna let you know. The way I see it, that's looking out for your best interests." "When primeval man first crawled out of the ooze, he had but one priority. To scratch. But after that, he set about finding shelter." Epcot:Future World, Fun with Technology. International Food & Wine Festival, Feeding (and Wine-ing) Frenzy! Disney's Hollywood Studios, Real Men Know Movies are the Perfect Date...We Don't have to Talk! Or Listen! Disney's Animal Kingdom, Real Men Get It Animal Style! Nothing To Be Scared Of (Right? ), You Did Pack Extra Underwear, Didn't You? ESPN Club, Because It's the Frickin' ESPN Club! Transportation and Ticket Center, "Too Late To Alter Course Now, Matey!" Downtown Disney, Real Men Aren't Afraid To Go Downtown! Now It's Time To Say Goodbye..., Dry Your Eyes, Little Fella. In addition to all the wisdom listed above, you'll find information about private fishing excursions, golfing at several PGA-rated courses, driving real race cars, catching Spring Training baseball, and dining on the best burgers, steaks, fresh seafood, pastas, and gourmet pizzas. And of course, information on the best beers and cocktails from all over the globe. 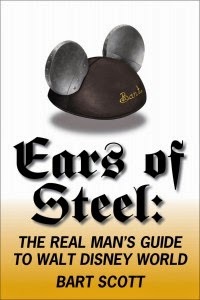 Ears of Steel also includes some interesting anecdotes with the "Man's Journal" moments throughout the book, a Turkey Leg Tangent, and Official Ears of Steel Recommendations. And NOW, a few words from the author, Bart Scott! *Jeanie: What inspired you to write Ears of Steel? Bart: Basically I was tired of getting that tilted-head, confused expression when people found out I, a grown man with a job and a mortgage and responsibilities, loved Walt Disney World. Many times I've heard guys say things like "I'm not going to Disney. It's for kids. There's nothing for me. My wife can take the kids on her own but I'm not interested." That stubbornness, and really ignorance, drives me crazy. Plus, as a writer and a Disney lover, I always wanted to write something about Walt Disney World and my obsession with it, but for me it had to be something funny- bordering even on ridiculous. That's when the idea hit:"why not a man's guide? A manifesto, emphasis on MAN...with tongue planted firmly in cheek!" I wasn't interested in just another Disney travel guide. Anybody can tell you what time the 3:00 parade starts. I wanted to write the funniest travel guide on the shelves, stuffed with personal stories and silliness. *Jeanie: What is the most important lesson that you would like readers to learn from your book? Bart: I guess it counts as a lesson to say "get over yourself." I still deal with guys all the time who just grunt and groan that they don't want to go and deal with all the "kiddy stuff." It's not all kiddy stuff- that's the point of the book. Walt wanted to create places where kids and adults could have fun together. And truth be told, the kid stuff is what most of us adults, men and women, really need! Whether you have kids or not, you have to let go, have fun, and live in a fantasy world for a few days or you'll end up doing a face-plant in your oatmeal one morning. It just helps that this fantasy world also serves beer at many locations! 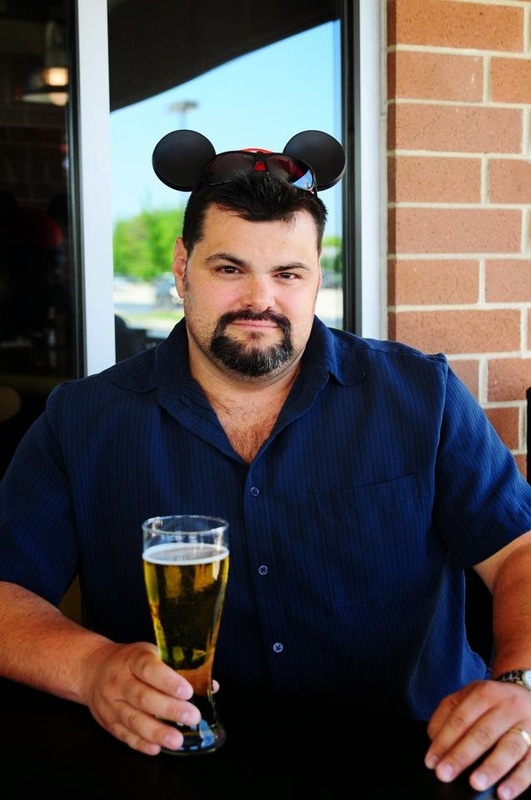 *Jeanie: As an Ears of Steel wearing guy, what's your favorite manly man activity when at Walt Disney World? Bart: Well look, I write about the race cars, the fishing excursions, hanging off the back of the speedboat like a human-kite, all the "manly" stuff in the book. I'm happiest with a long day at a Disney park riding rides, taking in the sights, sounds, etc., and then ending up sitting beside World Showcase lagoon with a cold drink waiting for Illuminations, or in Downtown Disney with a pint at Raglan Road listening to a live acoustic duo. Those are the moments I live for- that really recharge the spirit batteries. Something we guys tend to forget to do throughout our regular lives. And of course I'll never say no to ripping smoked flesh from bone with a cold Safari amber at Flame Tree BBQ at Disney's Animal Kingdom. Can't wait 'til that becomes a night time experience - as well as a few other things I hear they're planning! Jeanie: What is the one thing at Walt Disney World that a man should avoid doing (unless his wife or children INSIST) in order to keep his "man card?" Bart: Without tipping my hand too much (you can read the book for that) there's actually little I'm not up for at Walt Disney World. I've got too many kids to worry about "cool" anymore. But I won't wear a fanny pack! You'll never see my wife and I in matching tie-dyed shirts (come on fellas!) And while it's possible I may or may not have made a late-night Dairy Queen run in a pair of lime green Crocs last night, I do not wear them to the parks! Jeanie: What projects are you working on now? Where can readers find you? Bart: Well besides the book, I host a weekly podcast called, cleverly enough, Ears of Steel:The Podcast. We're not your typical Disney news & rumor show - don't want to be. We talk the parks, movies, pop culture, sometimes nothing Disney at all. We have had some great guests on, from Princesses (yeah, that's right) to former-Imagineers to current Disney community celebs. It's my favorite hour of the week. I'm also on a podcast called Drunk on Disney with the incredible voice-actor Dana Snyder and podcaster-extraordinaire Guy Hutchinson. Each week we make a cocktail found somewhere on Disney property and then just swap Disney stories, discuss "what if" scenarios, pine for lost attractions, and fall down various rabbit holes along the way! It's a blast! Even when that pesky Drinkfinder appears! Beyond that I'm just promoting the book and trying to figure out what's next. There will definitely be more to come in the Ears of Steel series. I'm always working on a couple novels, mostly for kids like my first book Balaam. And I've always got a few other projects marinating in my brain! *A special thank you to Bart Scott, for taking the time from his busy schedule of work, kids, podcasting, and indulging in adult beverages to do this interview. Come to the DARK SIDE...of DISNEY!